The whole world mourns the tragic events that took place yesterday in central Paris, as a massive, accidental fire engulfed Notre Dame cathedral last night, taking down the iconic cathedral’s spire among many other damages. 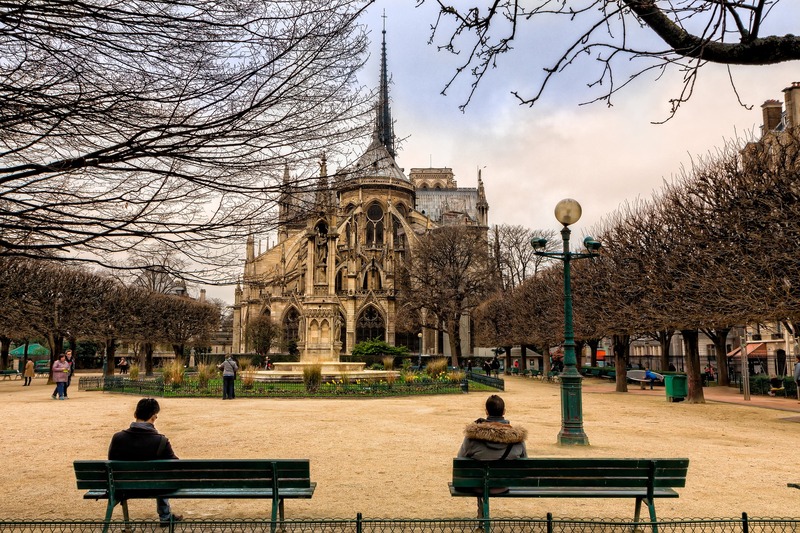 Today, we wanted to pay homage to this symbol of Paris, France and Gothic architecture, reminiscing about a few of the many facts that make Notre Dame the iconic landmark that it is today. Muse of Victor Hugo and proof of greatness during the 14th century, the Cathedral of Notre Dame is linked to numerous evidences but also secrets and curiosities unknown to many, that will bring you closer to the history of this Gothic jewel. Many important historical events have taken place in Notre Dame, starring very relevant characters in history. 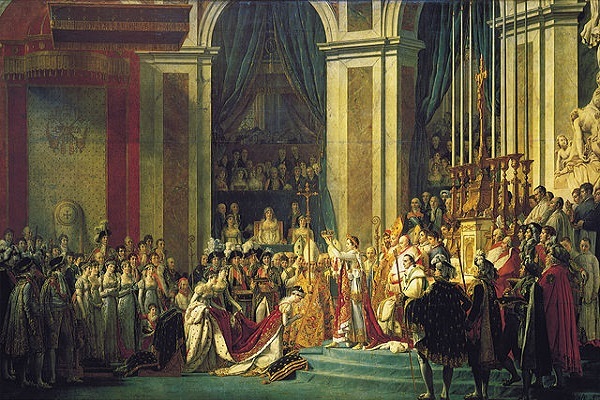 On one hand, Napoleon Bonaparte was crowned inside the famous cathedral on December 2nd 1804. A coronation he granted himself from the hands of Pope Pius VII, trying to move away from the traditions of the Bourbon House. Later it was Napoleon himself who crowned his wife, Josephine of Beauharnais. Another remarkable historical event that took place inside Notre Dame was the beatification of Joan of Arc in 1909. A key figure in the Hundred Years’ War and symbol of the union of the French nation, the French heroine was burned alive on May 30th 1431 in Rouen. The coronation of Henry VI of England was another great event that Notre Dame Cathedral witnessed in 1429, as well as the celebration of the Requiem Mass of General Charles de Gaulle. Notre Dame began to be built in 1163 under the reign of Louis VII, and it’s been subject of many threats since. But was not until 1793 that it suffered the hardest of all its sieges. It was then, during the French Revolution, that many of its treasures were destroyed and stolen. One of the most renowned pieces of art in the cathedral is the Gallery of the Kings of Judea and Israel, a horizontal strip of sculptures placed over the gates. This piece represents the 28 kings of Judah: in the center, we can see a king with a lion resting at his feet. It is the famous “lion of Judah”, symbol of the Tribe of Judah according to the book of Genesis in the Bible. According to Hebrew tradition this tribe were ancestors of David, second monarch of the ancient Kingdom of Israel. This group was brought down with the false belief that they represented the kings of France, and each one of them was beheaded. Their heads were found later in the 1970’s and are now on display at the Cluny museum. In 1871, a civil uprising tried to burn the cathedral. A fire was started inside the cathedral using wooden chairs and benches, fortunately, it didn’t spread. The gargoyles are one of the most characteristic architectural elements of Notre Dame Cathedral, whose main function is to evacuate the water from the rooftops. However, for some reason, the chimeras and gargoyles that adorn Notre Dame Cathedral are surrounded by a subtle halo of mystery, perhaps partly due to the legends that revolve around their presence in the monument. Until the 18th century, society’s greatest fears were turned towards the devil. He was held responsible for everything that could happen and people were constantly trying to protect themselves against it, especially in sacred places. And how can you protect yourself better from the demons than by driving him away? This is what the builders of cathedrals probably had in mind in the 13th century when they sculpted the first gargoyles. Indeed, these emblematic stone sculptures representing evil creatures had a pragmatic purpose, to evacuate water, but also two symbolic purposes: to remind the faithful that they must constantly beware of the devil and repel evil with their ugliness. Thanks to their demonic appearance, they are the guardians of the holiness of the place. Today, the gargoyles placed at the vertexes of the cathedral towers watch the city expectantly, witnessing the evolution of the centuries over the City of Lights. Did the Hunchback of Notre Dame really exist? If there is a character closely related to Notre Dame Cathedral that is Quasimodo, or also known as the Hunchback of Notre Dame. The character created by Victor Hugo has been the object of many suppositions. Did he really exist or was he simply the result of the author’s invention? The Hunchback of Notre Dame did not exist as Victor Hugo tells us in his novel, but there was a person who inspired the writer to create such a character. It was one of the sculptors who worked on the remodeling of the cathedral during 1820, who was known for being hunchbacked. Victor Hugo, who at that time lived in the same district in which the sculptor worked, could see in him the character that would later give him worldwide fame. One of the best-known legends of Notre Dame Cathedral is that of the Devil’s Gate. This tells the story of a young locksmith, Biscornet, who was in charge of building the side door of the cathedral, known as Sainte-Anne’s Portal. Such a project overwhelmed the locksmith, who invoked the devil for help by entrusting his soul in exchange for a great result that would promote him to master locksmith. The next day, Biscornet was praised and praised for such a wonderful forge masterpiece, achieving the status of Master. The devil, hastened to get the agreed soul of the locksmith, did not stop tormenting him until Biscornet was found dead in his bed. Today, Sainte-Anne’s Portal and its marvellous wrought iron work are still object of speculation. The head of a demon can be found on it, and the gate’s extraordinary precision is hardly attributable to a young apprentice and to the rudimentary tools of the time. Biscornet’s work was replaced in 1860, although it is said that his soul runs through Notre Dame. A big medallion can be found on the ground att the square where Notre Dame is located, reminiscent of the shape of a rose of the winds. This point indicates the point zero from which distances are measured in France, being also considered the center of the city of Paris. In conclusion, and despite yesterday’s tragedy, Notre Dame remains today a referent of the Gothic style and one of the most elegant and stately monuments in Paris and the world. Here at My Private Paris we are optimistic about the future, hoping to continue to show Notre Dame’s marvels again very soon and for years to come. Coming to Paris soon? Click here to request a custom tour of the city. This entry was posted in French History. Bookmark the permalink. ← Easter in Paris 2019: Hunt for the best chocolate in Paris!